I recently went to Paducah KY where the Kaffe Fassett "I am an Artisan" contest quilt exhibit is. I read Mayleen's blog and she made one of the quilts in the contest. It is one of my favorites so I had my picture taken by it. Check out her blog where she talks about it. I'm working on some bindings right now so I hope to have some quilty photos soon. Thanks for including a photo of my quilt in the Artisan exhibit! It looks good and so do you! What? You squeaked in a visit to Paducah and still worked on all those quilts? You are amazing. It is a gorgeous quilt, way beyond my abilities. How fun! Mayleen’s quilt is amazing! So glad you had some fun in Paducah! A stunning quilt, and great photo! Glad you got to Paducah before your surgery, too! What a great trip. I bet you had a wonderful time! It’s a gorgeous quilt for sure. 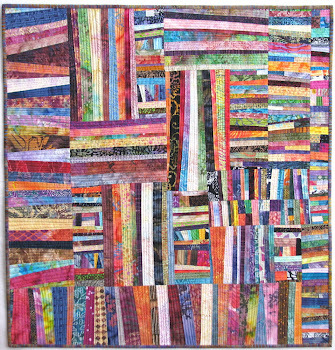 I read her blog and her quilts are all very striking. You are looking very trim and healthy, good to see you. i can see why you and Mayleen are friends. . . Her talent is extraordinary in every way. I love that quilt. Her choice of fabrics and design took my breath away. I will checked her blog and will do so again. I agree you look great in the photo also, and assume you went to KY. before your surgery. If you have gone since surgery, you are 'super women' for sure ! Absolutely gorgeous quilt. That must of been overload to see all the Kaffe fabrics used there. You look great btw! That is such a fun quilt and you are looking good! 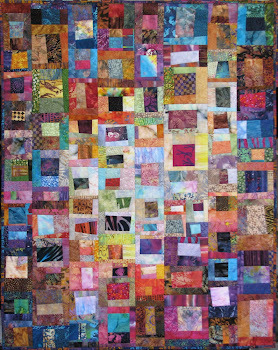 Quilt Inspiration just featured the "I Am An Artisan" winners. Such beautiful ways to use these wonderful prints. Your friends quilt looks amazing! I have one hanging very close to it. So exciting that you got to see them in person. Pictures just never seem to show the beauty of the fabrics! Mine was called the Blue Plate Special. The I Am an Artisan contest was fun to enter, I hope the new owner of Free Spirit does some more contests. Goodness, such an amazing quilt, wonderful use of the Artisan fabric range. I can see why you so like that quilt - it's fabulous!